I spoke on behalf of the Scottish Socialist Party at a public meeting hosted by the Communication Workers Union in Inverness last week. 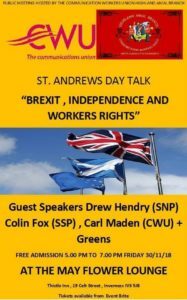 The St Andrews Day event on ‘Brexit, Independence and Workers Rights’ heard me remind people November 30th is also the anniversary of John Maclean’s birth. I pointed out that the SSP stood in the same shoes as the famous Red Clydesider as international socialists who campaigned for Independence because it would be both a defeat for British capitalism and an advance for democracy. ‘British democracy’ faces its most important vote in 50 years next week when Theresa May’s ‘Brexit’ deal comes in front of the Westminster Parliament. The stakes are so high and no one knows how the vote will go. It’s possible all the options are rejected and Britain heads for a ‘No Deal’ Brexit. 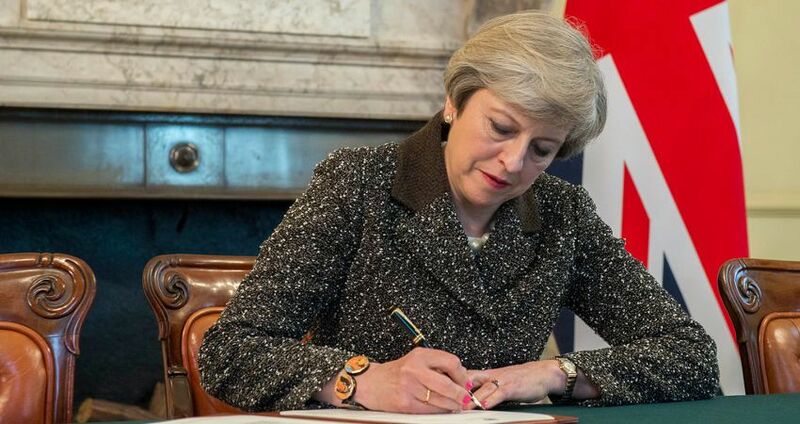 Above all May’s deal reflects the weak hand Britain had throughout the negotiations given the margin of victory by the Leave side. If May’s deal is rejected however, as seems likely, it will usher in a period of profound economic and political uncertainty the consequences of which will be far reaching for Britain’s ruling class, who are, to say the least, conflicted. Regardless of what trading terms prevail at the end of March however ‘you can bet your bottom Euro’ the attacks that have rained down on working people for decades by both the EU and successive UK Governments will continue. That’s about the only certainty in this whole affair. Workers will continue to suffer the effects of poverty pay, casualisation, privatisation of vital public services, widening inequality and greater indebtedness unless there is greater resistance than hitherto. Against this background Independence is seen as the escape hatch by working people in Scotland. Self-determination is driven by a profound desire for change. But to win the day our movement needs to spell out precisely what independence is for and how it is to be achieved. Is Scotland to remain for example in the grip of neo-liberal free market capitalism with low taxes for the rich and low wages for the working class? Are our hospitals, schools, railways and prisons to be owned by private companies under corrupt Private Finance Initiative (PFI) schemes or Scottish Future’s Trusts? Is our oil industry and renewable energy sector to remain in the hands of private capital or, like Norway, will they be owned by the people? Will Scots continue to be exploited by employers using the worst anti-union legislation in Europe or will we be able to tell them to ‘take a hike’? Independence for the SSP is about breaking with the UK state and its brutal free market economic model that sees wealth and power concentrated in the hands of a ruthless, corporate elite. But the $64m question is how do we secure it? First, we need to persuade Scotland’s working-class majority of our case. That means guaranteeing them dignity at work, higher living standards, improved social services publicly owned, where Scotland’s huge wealth is shared out equally amongst us all. The SSP has been critical of Nicola Sturgeon’s decision to tie the case for Independence to EU membership because poor tactics lead to bad outcomes. Tying Independence to the EU not only peddles illusions in the EU, it undermines the fundamental case for self-determination. That is not what EU membership brought Greece, Ireland, Italy, Spain or Portugal. The EU Treaties underwrite the power of multinational capital and centralise power in the hands of an un-elected bureaucracy in Brussels. As things stand the pursuit of a second referendum on independence is a tactical dead end. Under the 1997 Scotland Act it requires a Section 30 Order from Westminster, just as in 2014, before it can happen. The UK Government has made it abundantly clear it will not grant a second referendum. So how do we respond? First, we need to win majority support for independence in the polls. We have never had it. People on the Yes side often talk about learning lessons from Catalonia. The first lesson to learn from Catalonia is that there is no majority for Independence there either, least of all among the urban working class. Only when we have secured that ‘bridgehead’ will we be able to force Westminster to concede a second vote. That could be done by mobilising that so far elusive majority using a concerted campaign of civil disobedience. It’s not the only option, but since the SNP has repeatedly refused to make elections the decisive ‘democratic event’ it is worthy of fuller consideration. So, after the Brexit dust has settled the Independence movement in Scotland must apply itself to making a more persuasive case to the country’s working class majority than hitherto. And having secured that majority, we must mobilise it intelligently behind a strategy that can win. That is the 2019 challenge I throw down to the Yes movement today. This is a column from issue 514 of the Scottish Socialist Voice. Get a print or digital subscription of the Voice sent to your door or email inbox on day of publication.